Nevada car insurance law requires all drivers to carry liability insurance and validates all drivers' insurance with an online verification system. Drivers who do not have valid auto insurance are subject to fines and other penalties. Read below to find out more about required and optional car insurance, and ways to find affordable insurance in Nevada. Drivers in Nevada are required to have liability insurance. Liability insurance pays for damage to another driver's car and any injuries resulting from a car accident for which you are found at fault. $15, 000 of bodily injury coverage per person. $30, 000 of bodily injury coverage per accident. $10, 000 of property damage coverage. Most insurance companies offer higher coverage limits for more protection. Ask your insurance agent for car insurance quotes of different limits to find the best plan for you. NOTE: New residents must register a vehicle within 30 days of moving to NV. Nevada uses an online verification system, Nevada LIVE, to verify the insurance information that you provide. You are at fault in a car accident. No one is at fault for an accident. You incur costs not covered by another driver's liability insurance. Collision coverage –Pays for accident-related damage to your vehicle. Comprehensive coverage – Pays for damage to your vehicle caused by external factors like theft or severe weather. Uninsured & underinsured motorist coverage (UM/UIM) – Pays for damage/injury caused by uninsured drivers or those without adequate insurance to cover your costs. Medical payments coverage – Pays medical expenses for you and your passengers. Rental reimbursement coverage –Pays costs toward renting a car while your car is being repaired after an accident. Towing and labor coverage – Pays for towing and roadside assistance. Guaranteed asset protection (GAP) coverage – Pays the remainder of a car loan if the car is a total loss and you owe more than it is worth. : If you are financing or leasing your car, you may be required to buy collision coverage and comprehensive coverage as part of your car agreement. If you drive without car insurance in Nevada, your driver's license and vehicle registration can be suspended. 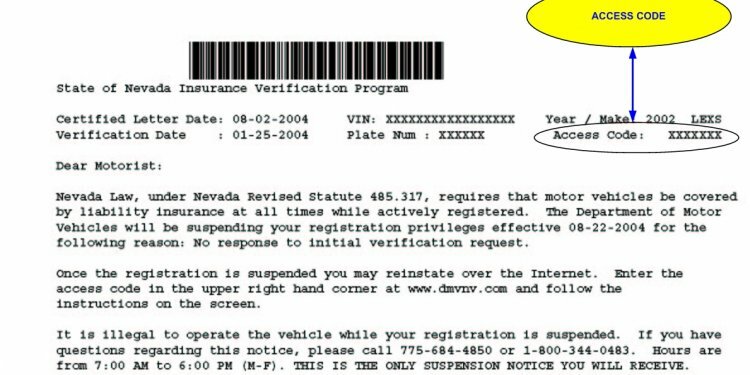 If the system cannot verify your car insurance, you will receive a notification postcard from the NV DMV. You must respond within 15 days to avoid suspension of your vehicle registration. Note that you may receive a notice when you change auto insurance companies. Immediate confirmation that your car insurance information is valid and a follow-up confirmation letter. A pending notification. The DMV will request your car insurance records from your insurer. You do not respond to the initial notification within 15 days. Your insurance company does not respond to the DMV's request within 20 days. If your registration is suspended, you will have to pay a reinstatement fee of $251 for a first offense. The duration of the lapse in your car insurance. The number of insurance violations you have had. Reinstatement fees varying from $251 to $751 depending on your number of insurance violations. Fines of up to $1000 depending on how long you went without auto insurance. SR22 insurance for 3 years if you did not have insurance for 91 days or more, regardless of how many violations you have had. Driver's license suspension for a minimum of 30 days if it is your third violation for driving without car insurance, regardless of the length of the lapse. Find the best state regulated programs in your state burial insurance for seniors Most Internet life insurance agencies use a limited number of companies because most of the final expense companies don't allow telephone sales. Know all the programs available in your state.